Burning calories and toning muscles has never been easier than with the Wakeman Portable Under Desk Exercise Bike. The simple design and portable size is great for any sedentary activity, whether that includes under a desk at the office or while watching your favorite TV show! The adjustable resistance can switch from low impact to high impact with just the turn of a dial, making it ideal for physical therapy or fitness training. Improving your health is both easy and fun with this Portable Under Desk Exercise Bike by Wakeman. IMPORTANT: Avoid buying counterfeit products and transacting with unauthorized sellers. Look for our logo on the packaging for every one of our products. Wakeman is committed to providing the consumer with the absolute best price and value on all of our products, which we ensure by applying a rigorous Quality Control process. Wakeman is a registered trademark protected by U.S. Trademark law and will be vigorously defended. EASY TO USE - Simply place machine on the floor and cycle to work leg muscles and burn calories. This pedaling bike can also be placed on a tabletop to help tone upper arm muscles. Non-slip feet pads and secure straps add stability and prevent sliding. 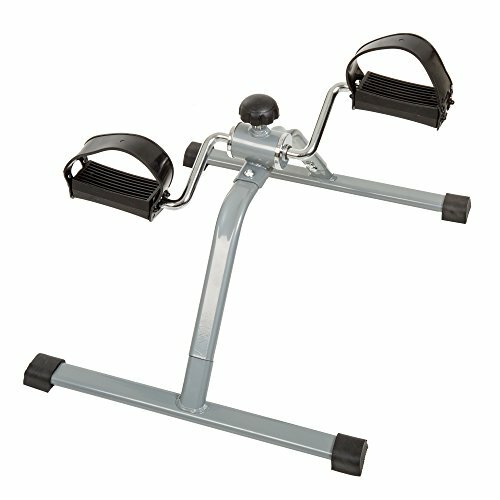 IMPROVE HEALTH-This exerciser bike benefits muscles for toning and strengthening and improves blood circulation. Bicycling is also easier on joints than more weight bearing activities, such as running. ADJUSTABLE RESISTANCE - The low-tension setting is perfect for rehabilitative purposes, or switch to a higher intensity for strength training and toning muscles. The customizable resistance dial can easily change tension appropriately. PRODUCT DETAILS - Dimensions: 22 in. (L) x 16 in. (W) x 15 in. (H), Pedal Width 4 in. Some assembly required, wrench included. If you have any questions about this product by Wakeman, contact us by completing and submitting the form below. If you are looking for a specif part number, please include it with your message.